Omnidirectional Microphone. This mini microphone can pick up sound around you from any direction. And its included spit guard prevents the plosion and makes better sound quality when recording. Suitable for video, broadcast, interview, etc. Plug & Play. No battery or extra adapters required. 3.5mm standard jack of the microphone is compatible with iPhone, iPad, Android & Windows smartphone devices and audio recording devices. The 3-rings design jack fits most common digital products with microphone input/output interface. Clip-on Design. 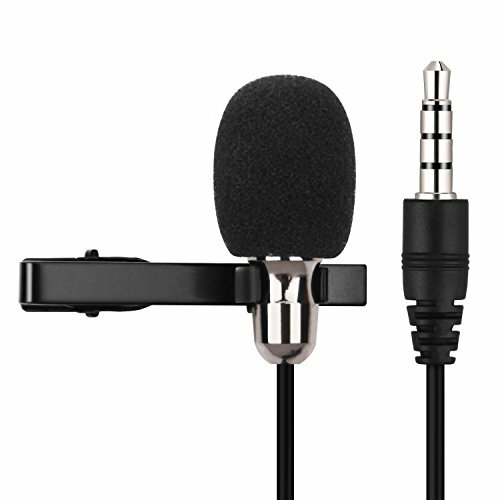 Mini microphone can be easily clipped on the tie or lapel, which achieves hands-free recording. Mini and portable. Coming with a carrying pouch makes the microphone more convenient to store and carry. Package Contents: Mugig Mini Microphone, Clip, Three Spit Guards, Carrying Pouch, User Manual, 6 Months Warranty.